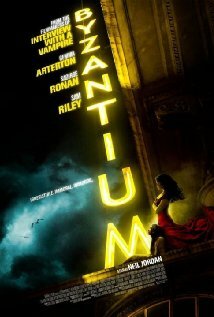 From dog food eating Chinese men to people eating Vampires, it's now time to talk about 'Byzantium'. The title will make sense don't worry. Ah, vampires and Neil Jordan, there's something that we haven't seen in awhile, the last time that occurred we were given the absolute gem that is 'Interview with a Vampire', and we all know how that turned out, one of Tom Cruises best roles in his entire career in my opinion. That film defined vampires for a generation in the cinema knocking back a lot of pretenders to the crown for at least a decade, so will lightning strike twice? Lets find out. Eleanor Webb is a girl who is sick of her life, she's bored, nothing thrills her,nothing excites her and she just wanders through life aimlessly. Her mother on the other hand, Clara loves life and loves being with her daughter. Its been going on this way for awhile now for the pair, about two hundred and nothing has changed for them, physically anyway since they're vampires. That was a little test, I wanted to see how long I could go into the plot before I had to say they were vampires, it didn't last long. Suffice to say they are vampires on the run for the last two centuries. 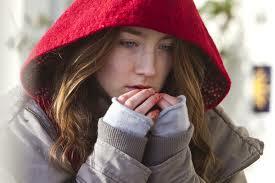 There is a lovely chemistry between Gemma Aterton and Saoirse Ronan, there is real love there. You really feel that these two people have a real history together, they have no home since they've been on the run for so long and Eleanor is really starting to get sick of it and the way Saoirse and Gemma portray the mother daughter relationship with heart and soul is fantastic. Saoirse brings such an awkward charm to Eleanor while Gemma gives Clara a seductive and powerful presence. This is as much a story about outsiders and the feeling of isolation as it is a film about vampires, and that is to the films credit. The way someone becomes a vampire in this film is unique and absolutely fantastic. It feels less like B movie monsters turning you into creatures of the night and more like being inducted into a new religion, albeit the Gods are far older. There is a sense that there is a world within a world in this film. That behind everything there is a darkness, but it is not necessarily evil which is an interesting dynamic. Something is dark and sinister yet noble at the same time, in my eyes it is a wonderful concept. Though the dynamic between mother and daughter is fantastic, there are some failings. The acting can at times be too dark and moody, and there is a constant trend of characters speaking in hushed voices giving off deeply intense dialogue. What I laughed at was that there is a theme that goes through each Neil Jordan vampire film and it made me raise a question. Why do these vampires always need to tell their stories? I mean come on, in 'Interview with a Vampire' Louis gave an interview telling his entire story. In this, Eleanor is constantly telling her story over the two centuries of her extended life. It's an element I believe is one of the weaker points of the film. It's a flawed film but there is one definite upside, not a single vampire sparkles. That is not strawberry jam. Vampires, I wonder when it'll all be done.